the most popular advice I heard when I was pregnant was, "get your sleep now!" while that was nice in theory, it wasn't all that practical. being a back sleeper myself + needing to use the bathroom every half hour + having back pain + all the other joys of a pregnant body = not as much sleep as I had been advised to take. now that little william is here, sleeping seems like a distant memory. it could be a lot worse and, to be honest, I think he is a stellar sleeper for a newborn. most nights he sleeps 3 - 4 hour blocks of time, wakes up to eat with some sweet lip smacking and then falls right back into dreamland. in fact, it's hard for me to snap a shot of him without his little eyes closed. I love, love, love him. Your little William is so beautiful.. I adore his strawberry blonde hair!! By the way I love your dish on delish blog.. I have used sooooooo many recipes from it lately. Congratulations Liz on your beautiful baby boy! He is perfect! Don't worry, he will start to sleep longer stretches pretty soon. Try to take naps with him during the day... it will definitely make waking up in the night easier!!! :) He is such a doll! That lip-smacking is just about the cutest noise in the world. Just remember to sleep when the little one sleeps. It is the only way. He not just cute, he's adorable! And in that sweater! He is absolutely perfect Liz, I get all mushy just looking at his pictures. 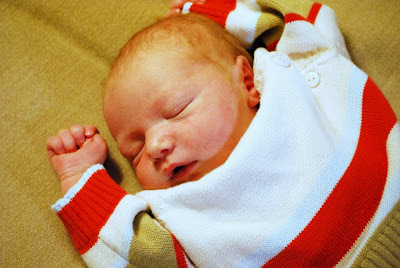 How fun to have another strawberry blonde boy in the fam! what a little sweetheart. congratulations liz! he is beautiful -and i love the strawberry hair! !